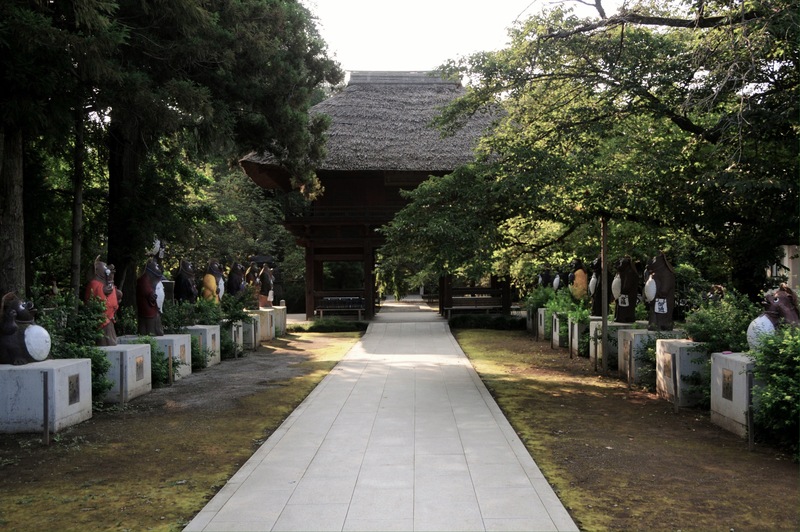 ﻿Morinji is a Zen Temple located in Tatebayashi City, Gunma Prefecture. It was established in 1426 and is famous for its connection to a shape-shifting tanuki. Tanuki are dog-like raccoon animals, and they are often depicted as mythical creatures. If you walk from Morinjimae Station to Morinji Temple, you can see picture signboards that tell the story of the tanuki, Bunbuku Chagama, along the way (in Japanese). 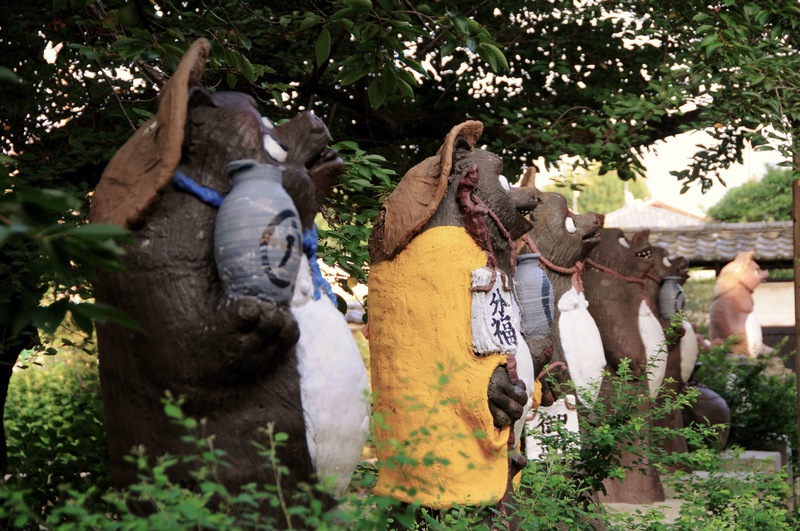 Upon arrival at the temple, twenty-one tanuki statues will welcome you into the compound. It is possible to enter the main hall for an admission charge of 300 yen. It is usually open from 9am to 4pm, and is closed on Thursday. During April, a giant weeping cherry tree blooms there. Morinji Temple is near Morinji-mae Station on the Tobu Line, one stop before Tatebayashi Station. If you do visit, keep your eyes open and perhaps you’ll catch a glimpse of Bunbuku Chagama. Once upon a time, a hardware salesman was walking along a road in a small village. He found a tanuki caught in a trap. He felt sorry for the animal and set him free. It ran, limping, into the bushes. Another day, on the same road, he found an old tea kettle. The salesman took it home and cleaned it up. He thought, “I’ll take this to the head priest of Morinji Temple. He is looking for a nice kettle”. The priest purchased the kettle and used it to serve tea at an important Buddhist memorial service. Surprisingly, no matter how much hot water he used, the kettle never ran out. Late that night a noise woke the head priest up. He was shocked to see a tanuki turn into a kettle right before his very eyes. The head priest woke up all the other priests, but all they could see was an ordinary kettle. “You were having a dream”, they said. The next morning, the head priest sent for the salesman to tell him that there was something strange about the kettle and he wanted it destroyed. Suddenly, the kettle ‘grew’ a head and limbs. The tanuki said, “I wanted to repay the salesman’s kindness, but it is very hard for me to remain a kettle for long periods of time. I had just begun to stretch when the head priest spotted me last night.” The head priest laughed and thanked the tanuki for making the previous day’s service so successful. 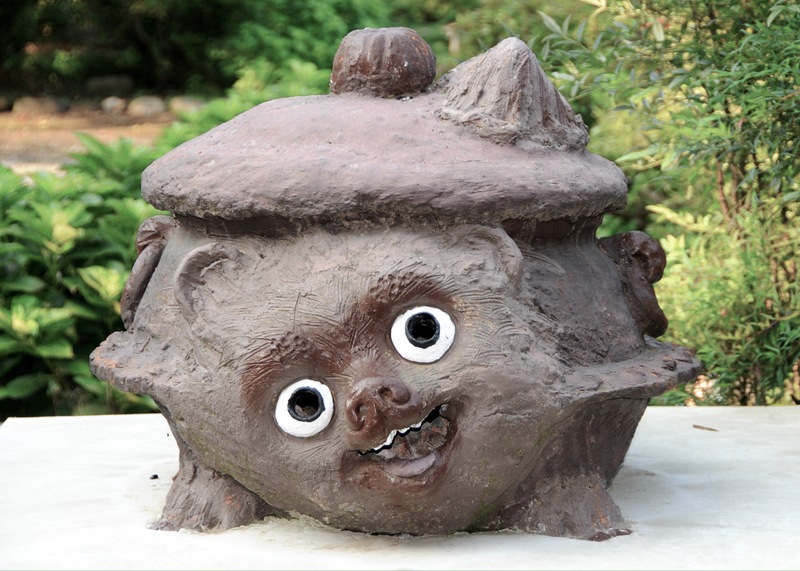 The head priest wanted to show villagers the unbelievable tanuki tea kettle. The tanuki said that he would be happy to perform for them. Young priests traveled around and let people know that unusual performances would take place at the temple. Many were curious and came to watch. The tanuki tea kettle danced, tumbled and even walked a tightrope! News of his amazing performances spread and many more people came. Admission was charged and the head priest donated the money collected to help the village build a bridge and repair a river embankment. He named the tanuki ‘Bunbuku Chagama’ or fortune distributing tea kettle. They say that Bunbuku Chagama still lives at Morinji Temple, Tatebayashi City, Gunma Prefecture. He sometimes changes back from being a kettle, stretches his legs, and walks around the temple in the middle of the night. *Translated from the signboards created by Hajime Abe. Beside the temple is Morinji Koen, a park built around a small marsh. On the far side of the park, during April, koi-no-bori are hung across a waterway lined with cherry blossoms. 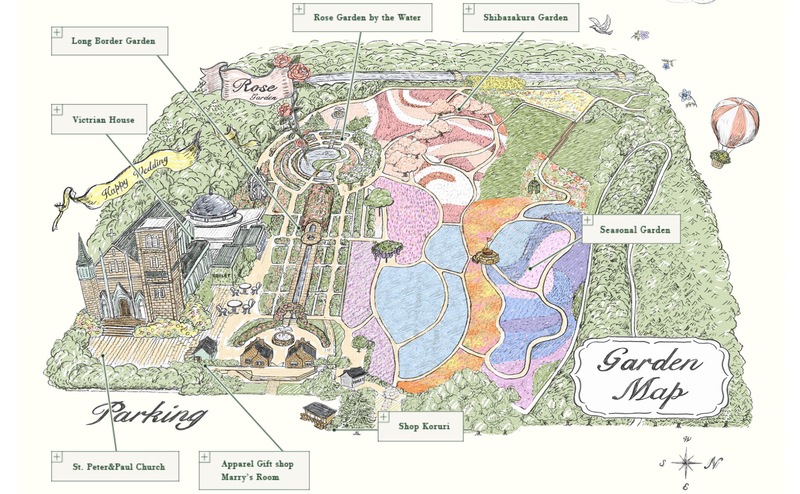 Ten minutes walk from the temple is the Tobu Treasure Garden – a large park decorated with European-style buildings and large flower fields. Entrance fees vary from 600 – 1800 yen, depending on the season.